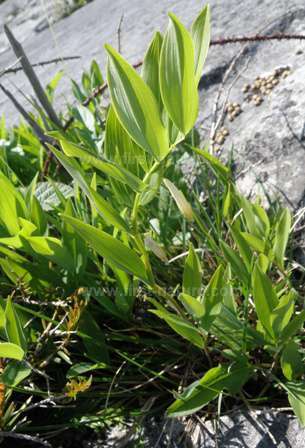 This plant grows to around 50cm in height and has whitish-green flowers which unlike it's close relative, Common Solomon's-seal Polygonatum multiflorum are not 'waisted' and are tubular in appearance. It gets it's name 'angular' from the stems which are more erect than those of Common Solomon's-seal and then arch at a quite acute angle towards the top. The leaves are more erect than with Common Solomon's-seal. The flowers are followed by black berries. In Britain this interesting plant is becoming more scarce and is now largely confined to a few spots in north/northwest England and in parts of Wales. Angular Solomon's-seal is a chalk loving plant which grows in rocky limestone habitats, often in limestone pavements, as pictured here. Angular Solomon's-seal flowers from May to July. We have seen this plant in Lancashire at Gait Barrows NNR and also in Craig y Cilau NNR on the southern edge of the Brecon Beacons in Wales.